BikeAthens is a non-profit cycling advocacy group in Athens, GA, with the mission to promote walking, cycling, and public transit as solutions to transportation needs in Athens. BikeAthens achieves this through education, advocacy, and community service. The BikeAthens app will enable cyclists by making information easier to access and connect the biking community in Athens. 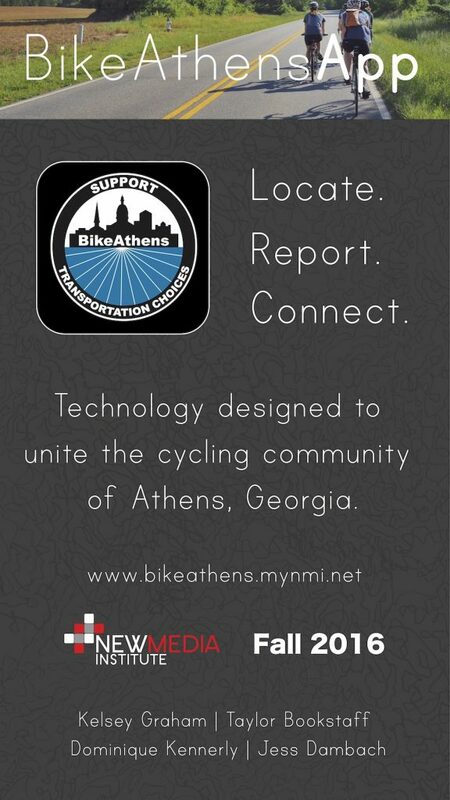 The app will allow you to access a digital map provided by BikeAthens, find out about events, and report collisions. This app will make Athens a friendlier biking environment! Is Barnett Shoals a suggested road to bike on? Is there a bike rack near this building? Through the app users will be able to see where they are on a GPS enabled map. This map will have the location of bike racks, repair stands, bike stores, pre-made routes and collisions reported by users. With the ability to press a button with information only you want. If you only want to see where the repair stands are, you click on the repair stand button and the map will only show the pins of where all the repair stands are in Athens! Tired of going on rides by yourself? Looking for a community to join? Users are able to join posted rides from within a Google calendar as well as create their own ride to invite other users. Just like a Google Drive where anyone can go in and add information, this in app Google calendar will enable any user to add their own ride or find out about other rides or events. This simple social calendar will help cultivate a broader community of cyclists throughout Athens. Collisions happen a lot more than are reported. BikeAthens petitions and advocates for a safer biking community to the Athens community. 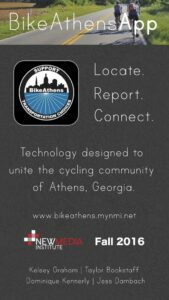 This feature of the app will allow BikeAthens to collect data to help improve and educate Athens on cycling. This is a tab where you can report any sort of collision that happens so that you can make Athens a safer place to bike!